The right-to-food campaign gets a fillip with the Common Minimum Programme of the new government incorporating far-reaching commitments on food security and the evolving constitutional doctrine that public welfare is a core obligation of the state. IT could be coincidence. Or it could be the case that committed public interventions cannot for long be denied the political recognition that is their due. 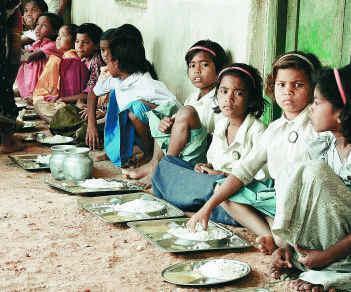 Mid-day meal at school in Orissa’s Bolangir district. The Common Minimum Programme of the newly installed coalition government headed by Prime Minister Manmohan Singh incorporates many far-reaching commitments on food security and child welfare. These are, in some measure, the recycling of older themes in social welfare policy, without a mention of the history of default on commitments given earlier. But there is a distinct change in the context. Quite apart from the pressure of public expectations, inherent in the mandate for change given in the last general elections, there is a perceptible shift under way in constitutional doctrine. Public welfare is now increasingly perceived not as an activity that the state can indulge in if it has the time and the resources left over from other essential activities. It is rather, increasingly being interpreted as part of the core obligations of the state. The CMP’s commitments on nutrition and child welfare in fact, go no further than the obligations that have been enjoined on the state - as part of its constitutional duties - by the Supreme Court. This shift in doctrine - this elaboration of the scope of judicial scrutiny over the state’s guardianship of the Fundamental Rights - has taken place in part, as a consequence of spirited public interventions at various levels, collectively known as the "right-to-food campaign". THE right-to-food (or RTF) campaign was formally launched in 2001 with an innovative mix of strategies, merging streams of social activism that had produced positive results in their own domains. The campaign depended in part on formally petitioning the judiciary for the enforcement of the right of every Indian to adequate nourishment. In this, it was inspired by preceding rulings of the highest court, which held that in cases of Fundamental Rights, it was willing to give little latitude to governmental pleas of financial stringency. Another tack that the RTF campaign adopted was awareness building, to bring moral pressure to bear on the administration at its interface with the people most vulnerable to food insecurity. Typically, the method employed - borrowed from the closely related campaign on the right to information - was the "jan sunwai" or public hearing, at which official claims of funds disbursement and assets creation were matched against the realities perceived by the supposed beneficiaries. A number of hearings of the RTF petition have been held in the Supreme Court since July 2001 and a series of orders of far-reaching significance issued. In November 2001, the Supreme Court directed all States to introduce a mid-day meal scheme (MDMS) for students in government and government-aided schools. It also ordered that the Integrated Child Development Scheme (ICDS) which was patchy and extremely selective in its coverage, be extended to provide universal coverage for all children below the age of six. From figures that had been submitted by commissioners appointed to assist in its deliberations, the Supreme Court concluded that at the minimum, this required that the number of anganwadi centres administering the ICDS needed to be increased from 600,000 to 1.4 million. Interestingly, the CMP incorporates some of the language of the Supreme Court’s recent orders without specific acknowledgment. "A national cooked nutritious mid-day meal scheme, funded mainly by the Central government," it promises, "will be introduced in primary and secondary schools." Also on the agenda is the "universalisation" of the ICDS, and the provision of "a functional anganwadi in every settlement (to) ensure full coverage for all children". If the Supreme Court’s orders since November 2001 are considered, the Central government would have no alibi for inaction on these two fronts, least of all the plea of financial stringency. According to commissioners appointed by the court, the Department of Women and Child Welfare (DWCW) in the Central government, has maintained that it would not be able to comply with the directive of the Supreme Court on this precise account. The number of functional anganwadi centres fell far short of the ICDS norm of one for a population of 1,000 (or 700 in the case of tribal areas). Correspondingly, the number of children theoretically covered was 34 million, against the total target population of 150 million. The actual coverage in fact, fell far short because of multiple leakages of resources from the system. In the estimation of the commissioners, no more than 26 million children are at present gaining the benefits of the ICDS. In response to queries from the commissioners, the DWCW had, as recently as November 2003, clarified that it was inclined to view the Supreme Court order "within the present guidelines, which apply to specific project areas". Universal coverage of all "settlements" was not conceived of, in part because the term "settlements" was not recognised within the guidelines. Far from expanding the number of anganwadi centres, the DWCW could only think of making the "existing and sanctioned centres" operational over time. It is significant that these pleas of incapacity and inability from the government have been replaced by the seemingly firm resolve of the CMP and the quite transparent adoption of the Supreme Court’s nomenclature on implementing the ICDS in all "settlements". In a report submitted last February, the commissioners had in fact sought an explicit clarification that the term "settlement" referred to "a cluster of households within a village". In other words, a specific caveat was to be issued disallowing the DWCW plan to confine the nutrition scheme to children within the catchment zone of existing centres. IN April, the Supreme Court revisited all the orders it had issued in response to the RTF petitions. It noted that the ICDS was "perhaps the largest of all the food supplementation programmes in the world". The scheme, though "elaborate", needed to be expanded considerably "to ensure that nutritious food reaches all those who are undernourished or malnourished". It directed the Central government to "file within three months, an affidavit stating the period within which it proposes to increase the number of anganwadi centres" so that coverage is extended to all the intended beneficiaries. The new government clearly has little time to waste between the adoption of the CMP and the actual provision of funds to back up its declared intentions on child nutrition and welfare. The Supreme Court also recorded with anguish that several States had simply not introduced the MDMS. Several others had introduced it in a token or cursory fashion; while others still had hedged it around with so many conditions as to make it of limited practical value. Specific mention was made of Bihar, Jharkhand and Uttar Pradesh, though according to the February report of the commissioners, Assam and Haryana also have failed to make even a beginning in providing mid-day meals. The court was also informed that several States - including Arunachal Pradesh, Delhi, Himachal Pradesh, Meghalaya, Mizoram, Orissa, Punjab, West Bengal and Uttaranchal - had made only very meagre provisions. Complaints that parents were being asked for cash payments to meet a part of the costs were recorded in the case of Maharashtra and Mizoram. And from Rajasthan, Karnataka and Chhattisgarh came reports of caste discrimination in the appointment of Dalits as cooks. Taking on board all these concerns, a Supreme Court bench comprising Justices Y.K. Sabharwal and B.N. Agrawal has directed all States that have not complied with the November 2001 order to do so "not later than September 1, 2004". Compliance reports in this connection have been called for from the Chief Secretaries of all States and administrators of all Union territories by September 15. Costs should not under any circumstances, be recovered from the parents of the children. And in the appointment of cooks and helpers, preference was to be given to Dalit communities and the Scheduled Tribes. Responsibility for financing the MDMS now is equally shared between the Centre and the States. The Supreme Court has now clarified that the funding for construction of kitchen sheds and for conversion of foodgrain into cooked meals should be borne by the Centre. The Central government would also have to meet certain strict performance norms in various other of its welfare schemes, notably the Sampoorna Grameen Rozgar Yojana (SGRY) and the Antyodaya Anna Yojana (AAY). In all these respects, the orders issued by the Supreme Court are very specific and moulded in accordance with inputs received from the commissioners on infirmities in the implementation of these programmes. There has also been in the case of the SGRY, an order requiring the doubling of both foodgrain and cash allocations for the financial year 2004-05. And in the case of the AAY, the requirement that a poverty certificate (the so-called "below poverty line" or BPL card) be produced as a qualifying requirement has been deemed unfair. In all these respects, the stated intentions of the CMP do not conflict with the requirements of food and nutrition security as spelt out by the highest court. Reflecting its awareness of the current status of the RTF campaign, for instance, the CMP has promised that "Antyodaya cards for all households at risk of hunger will be introduced". Similarly, without going into specific figures, it has held out the assurance that "public investment in agricultural research and extension, rural infrastructure and irrigation (will be) stepped up in a significant manner at the very earliest". Doubling the allocation of foodgrain and cash for rural employment - in accordance with the Supreme Court directive - could be one method of fulfilling this promise. Yet with all the promises that it makes, the CMP does seek an escape clause. While setting a three-month deadline for the government to work out a "comprehensive medium-term strategy for food and nutrition security", the CMP does qualify the objective of achieving "universal food security" with the feasibility imperative. But if the trend of judicial hearings in the RTF petition are any indication, this plea may not cut much ice. Earlier pronouncements by the Supreme Court have already ordained that the government should "cut the flab" elsewhere to fund its essential welfare commitments. In preparing its first Budget, the Congress-led coalition government at the Centre would need not merely to take into account fiscal stability, but also the new doctrine of judicial scrutiny over its guardianship of the Fundamental Rights.